Happy Thursday! Don’t you love a good furniture makeover? Me too! Generally I’m not about painting perfectly good wood or antique furniture but sometimes it’s the best way to refresh a piece of furniture! When we bought our lake house several years ago we hauled tons of furniture from Pennsylvania to Happy Hill. Most of it came from antique and thrift stores and some pieces were kindly donated. My sweet next door neighbor gave us an entire bedroom suite complete with queen size bed, dresser, nightstand and mirror. The bedroom set was stained a medium reddish brown but I decided to paint it all white. I immediately painted the bed frame and nightstand so all that remained unpainted was the dresser. This Amy Howard chalk paint is my favorite go-to paint for furniture. Back to the dresser….I knew I wanted to replace the existing hardware so I pulled out a few options from my stash. I planned on using these pretty brass ones. 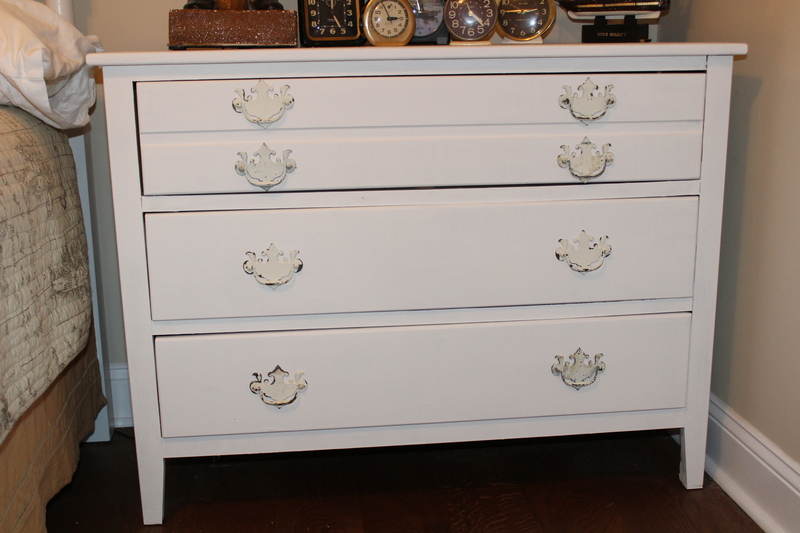 I painted the drawers and the dresser with two coats of white chalk paint. I drilled a second hole in each drawer to accommodate the larger pulls. It wasn’t until I was finished painting that I changed my mind about the pulls. I found these distressed white ones in my treasure room and liked the way they looked better. Plus they seem a little less feminine for my son’s room. Don’t you agree? And I had ten of them so I have two left over for the nightstand. I love how the dresser looks painted. It fits the cabin-esque vibe of the house now. Below is actually a better reflection of the true color of the dresser than the one before.